I am kind of addicted to breakfast cereals right now…as you can probably tell from all my porridge recipes. 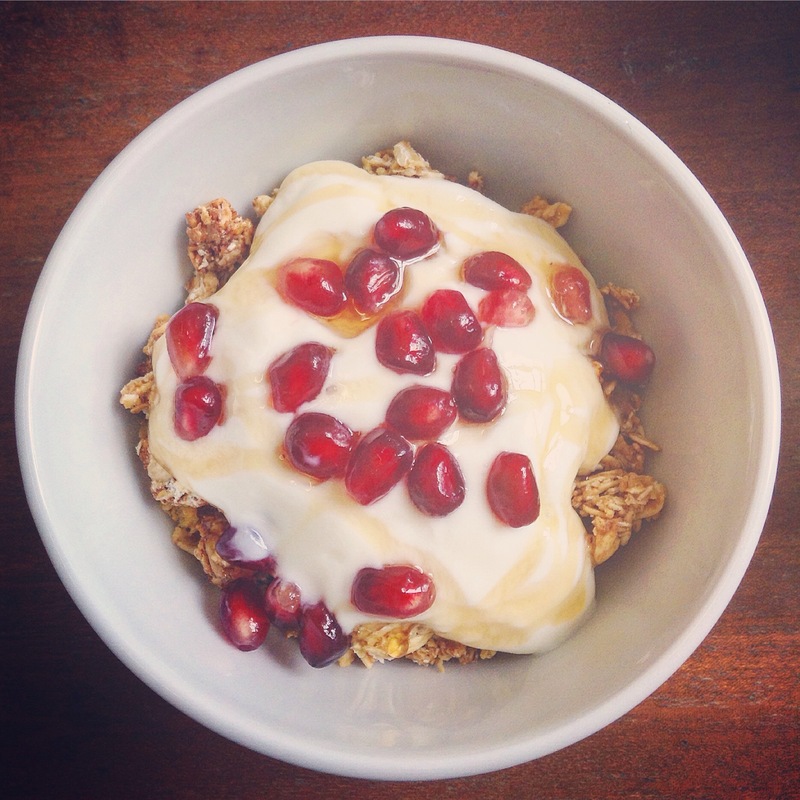 Recently I have had the biggest craving for granola with homemade yoghurt and fresh berries. I don’t like buying granola, as it often contains too much sugar. So I thought I would come up with a healthier alternative! The great thing about making your own muesli or granola is that you can put all your favourite ingredients in. I find shop brought granola so generic and boring. My granola is packed with amazing ingredients, that you wouldn’t find in the typical shop brought stuff. I know a lot of people use almonds in their granola, but i wanted to do something different. I also had a wicked craving for roasted cashews so thought I would throw some in with pecan pieces! The result was a granola that tasted far more decadent than any shop versions that I have tried. For the fruit I used black mulberries, green khorog raisins, goji berries and sultanas! I used a bit of honey and coconut sugar to sweeten, far more friendly than conventional granola, which uses a lot of cane sugar. 1 cup of your favourite dried fruits. I used a mixture of goji berries, green khorog raisins, black mulberries and sultanas. Preheat your oven to gas mark 4. Place the pecans and cashews in a food processor and pulse briefly twice. You are looking for a mixture of nut pieces and ground nuts. Add the nuts to a large bowl with the oats and set aside. Melt the coconut oil and add to the nuts and oat mixture. Stir in the vanilla powder, cinnamon, coconut sugar and honey. Spread the mixture onto a flat oven tray and bake for ten minutes. Check and spread the mixture around to ensure it doesn’t burn. If needed put back into the oven for a further five minutes. Once cool and hard, add your dried fruit! Tip into an airtight container! It should keep for a few weeks – we have never tested it beyond that because we snarfle the whole lot in about a week! Serve in a variety of ways! I am obsessed with covering my granola in greek yoghurt, honey and fresh berries! It also tastes amazing sprinkled on top of smoothie bowls! How do you like your granola! Let me know in the comments below! Posted on June 25, 2015 January 7, 2016 by TinaManahaiPosted in RecipeTagged breakfast, coconut, craving, goji, granola, Healthy, nuts, seeds, snack, yoghurt.